distribution Present essentially throughout the Piedmont and the southern and western Coastal Plain; apparently absent from the eastern third of the Coastal Plain. Scattered across the length of the mountains, but with several large gaps in the range. No records yet east of Northampton, Pitt, and Onslow counties. Records only for 1/3rd of the mountain counties, but likely present in all 17 counties there, as the distribution covers counties from the VA state line to the GA state line. abundance Uncommon over its range in the state. Locally fairly common to common at a few sites in the western Coastal Plain/Sandhills and eastern Piedmont; however, not reported recently from many of the counties in these latter areas. flight Mid-June to early November in the Piedmont and Coastal Plain. The mountain records are fairly late in the season -- early August to mid-October. habitat Rivers and larger streams, typically where the current is slow to moderate flowing. 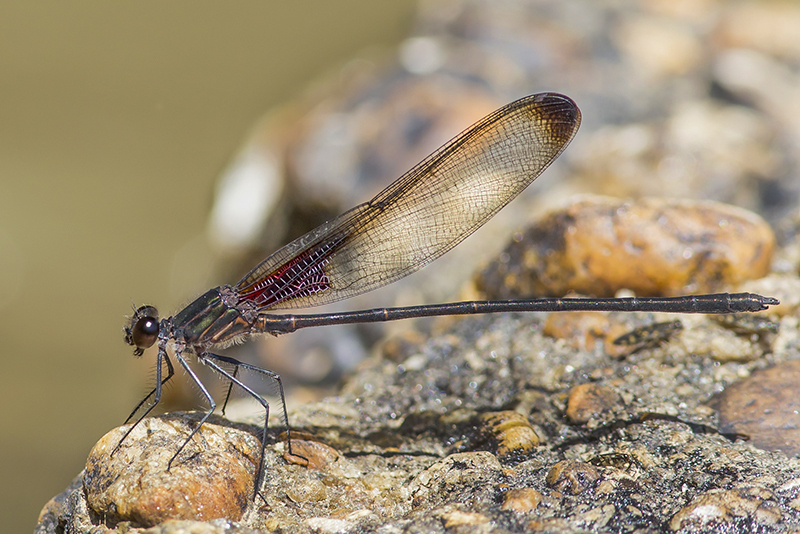 Apparently at larger rivers and slower-flowing waters than is the American Rubyspot, though the habitats overlap, and both can occur along the same stream or river. behavior This species is more wary than is the American Rubyspot, making photography or close observation of one more challenging. comments Considering the large number of counties known for the species (over 60), we have recent records for barely 20 of them. In some species, this would indicate a decline in the population of the species. It is premature to say that a decline has occurred, and perhaps the species is being overlooked as American Rubyspots. At any rate, the relative scarcity of recent records is surprising, if not disturbing, for such a fairly large and conspicuous species. Thankfully, Mark Shields had several quite large counts of the species in August - September 2016 along the Lumber River. Comment: Yadkin, 2017-09-03, Yadkin River at Donnaha River Access at NC 67 bridge. - Males. The red patch at the base of forewings often appears dark when the wings are folded. Comment: Harnett; C, 2017-07-21, Cape Fear River, Erwin. From NC 217 bridge to 2 km upstream, by kayak.